Competing as the SAS Mountain Lions, we field 32 interscholastic teams in 12 sports. In an age that encourages specialization, many of our athletes wear multiple hats - or helmets, and our coaches respect and encourage the multi-sport athlete. Interested in getting off the bench at SAS? Contact us today to schedule a visit or conversation with an SAS coach. Positive coach-athlete relationships help our athletes to revel in their successes and learn from their disappointments. At SAS, coaches communicate clear expectations for team membership to both athletes and parents. SAS believes in the importance of mutual respect between coaches and athletes and the support of parents in this important relationship. All of our coaches, athletes, and parents sign our Athletics Covenant which reinforces this. I will offer positive support for my child's athletic participation. St. Andrew's-Sewanee's Wood-Alligood Gymnasium includes a basketball court with bleachers, the Goldfinch Wrestling Room, a state-of-the-art weight room, and an indoor batting cage. Outdoor facilities include a baseball field, six competitive tennis courts, and a 400-meter all-weather 6-lane track surrounding a football/soccer field. Swimmers use the indoor pool at the Fowler Center of the University of the South, and the golf team utilizes the University's award-winning Course at Sewanee. St. Andrew's-Sewanee students also have access to the University of the South's Robert Dobbs Fowler Sports and Fitness Center and Brunton-Guerry Tennis Courts. The Fowler Center houses an 8-lane 25 yard swimming pool complete with diving well, racquetball, handball, squash, volleyball and basketball courts, indoor tennis courts, an indoor track, and a climbing wall. Mountain bikers ride the 10 miles of single track on SAS's 550-acre campus as well as trails on the University's adjoining 13,000-acre campus and the nearby Franklin County State Forest. A facility for storage and repair sits next to the Outing Building. Rock climbers practice in the SAS Bouldering Cave and on the climbing wall at the University's Fowler Center. With our campus perched on a sandstone plateau (elev. 1,900 ft), numerous opportunities abound for outdoor challenges. 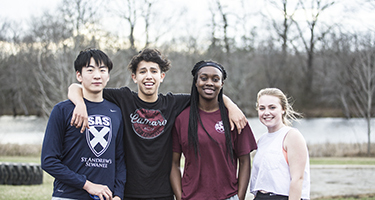 St. Andrew's-Sewanee conducts its athletics program with utmost integrity and according to the rules of Tennessee Secondary School Athletics Association. 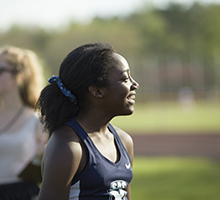 The practice of good sportsmanship and fair play applies not only to athletics, but also to the way all members of the SAS athletics community conduct their lives. 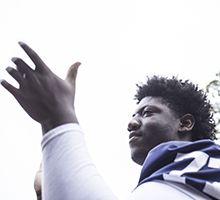 SAS is a member of the Tennessee Secondary School Athletic Association's (TSSAA) and plays in Division II East Region for independent schools. In swimming, which is not sanctioned by TSSAA, the school competes with area opponents. Our 8-man football team participates in the Middle Tennessee Athletic Conference (MTAC). 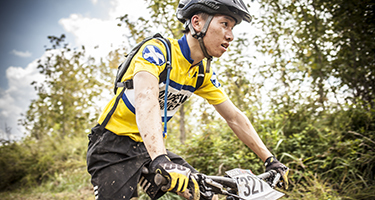 And, the varsity mountain biking team is in the Tennessee Interscholastic Cycling League. The SAS Swimming and Diving Snowball Invitational is one of the largest championships in the region. The Mountain Top Wrestling Invitational annually welcomes more than 130 contestants. And, the SAS trails are the location for the Tennessee Interscholastic Cycling League Championships. Students also compete in climbing as a club sport.